Folio 1078 of the Codex Atlanticus features a not-entirely-finished drawing lacking any innovative aspects worthy of note. Leonardo created the illustration of a saw in the center of this folio using decidedly rapid, sketchy strokes that in many parts are not completely defined. 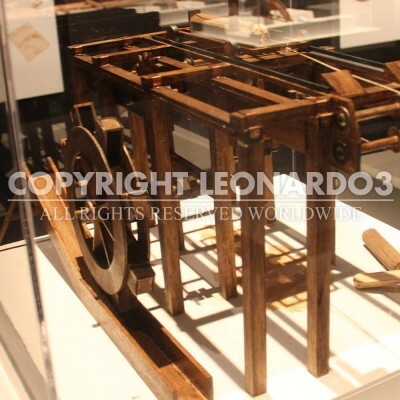 Leonardo used the same rapid strokes to draw details of internal mechanisms like hooks and transmissions. The subject of his drawing is a hydraulic saw that exploited the energy of a mill. The log to be sawed would be placed on a movable cart. The action of the mill would then supply energy to the machine, moving the blade up and down while also moving the cart and the log in the same direction as the cut. This model of saw is extremely valid and has even been used in more recent historical periods. Similar models have existed in some mountain areas where the action of the mill was replaced by an electric motor. 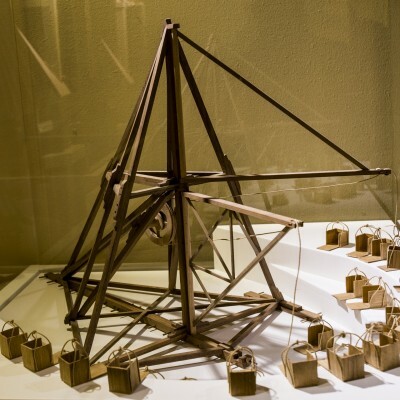 However, there is trustworthy evidence of this design from even before Leonardo’s time. In analyzing and interpreting Leonardo’s work we should understand and accept that not all his drawings and designs necessarily represent imaginative and original ideas. Most of the drawings contained in the Codex Atlanticus, but also those in lesser known manuscripts, are visual annotations on existing machines that are often misunderstood and interpreted as completely new creations. 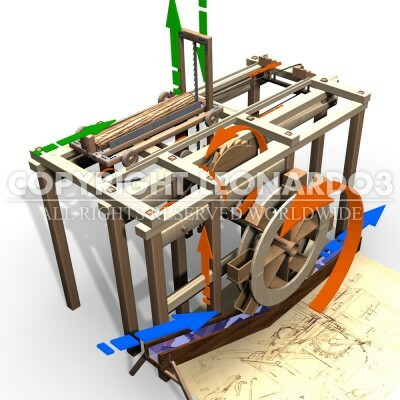 Leonardo made all these notes and annotations to remember things he had observed during his travels, or on a visit to the workshop of a fellow engineer or, as in this case, to a sawmill. It should come as no surprise that Leonardo preferred the immediacy of the visual language of drawings over the textual language of the written word.